Please read responsibly. Do not consume Login while driving or operating heavy machinery. 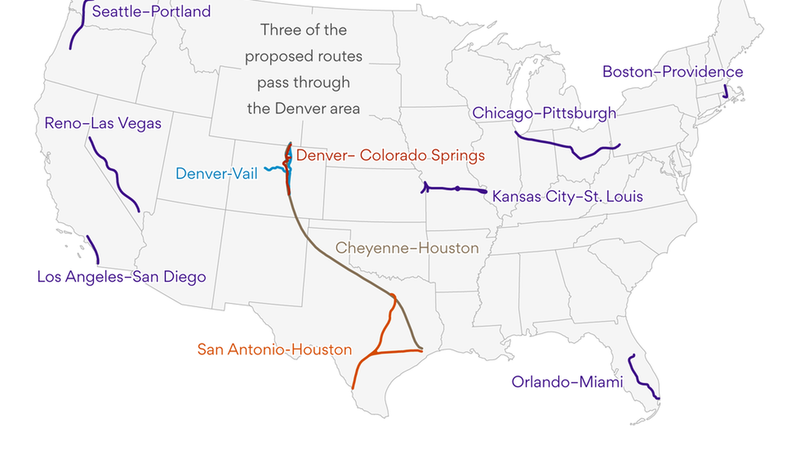 Hyperloop One, the company trying to bring to market Elon Musk's "pipe" dream of high-speed transportation via a super-sized tube, is looking for believers. The company knows it needs transportation regulators on its side and that timing is crucial with a major infrastructure package on tap. So the company's executives talked at a glitzy event in D.C. on Thursday about why they see their potential product as revolutionary for transportation. CEO Rob Lloyd told Axios' David McCabe he hopes to have a service up and running within five years. The reality: This technology has a long way to go. The company just completed a test track in Nevada where executive Nick Earle says that it will hold a major test-run this summer. Addressing safety concerns: Regulators are going to be concerned with whether this ultra-fast transportation method is safe. "It's hard to make the safety case when the technology isn't yet fully built," Lloyd said. Getting political support: Buy-in from local and federal regulators is key. Lloyd said that his goal is lining up Hyperloop with government programs that already exist, adding "then creating this collaborative co-creation process around the safety certification is required." Figuring out technical challenges: CNN's Matt McFarland notes that the company will need to make sure that a vacuum stays constant in the tubes and that it has to figure out how to deal with possible turns which could cause discomfort for its customers. Answering questions about integration: Earle noted that people question whether you can put a Hyperloop network underground (the company thinks you can) and whether passengers would need to catch their ride from a central station rather than a station close to their house. But Lloyd is optimistic: "What keeps me up at night is that's difficult. What encourages me is that there's a groundswell of support from people and that there is an open channel for top-down support." In any case, this is definitely going to be a case to watch as it highlights just how much information lies in the hands of tech companies and how reliant the public is on such companies to stand up to government intrusion. Not surprisingly, the ACLU is also fighting the government as it represents the person behind the Twitter account in question. Really wish you were at Apple's Mac Pro meeting? I think we've covered the key points from Apple's Monday sit-down with Axios and other reporters. But if you really want to feel like you were there, TechCrunch posted an edited transcript of the whole affair, minus a couple of off-the-record comments. Access, the Alphabet unit formerly known as Google Fiber, continues to undergo big changes. The company has already cut staff and scaled back some deployments, with a focus away from fiber and onto alternative technologies, such as fixed wireless. In the latest sign of retrenchment, two top executives are leaving the unit. According to Bloomberg, Milo Medin and Dennis Kish are both leaving Access but remaining at Alphabet. The moves were announced internally by Gregory McCray, who took over the helm of Access in February. For the first time, J.D. Power's tablet satisfaction survey found Microsoft Surface owners more pleased than their iPad owning counterparts, with a score of 855 compared to 849 for Apple. Samsung placed third at 847 with all three earning higher-than-average marks. Even J.D. Power seemed surprised, with its PR email beginning "Yup, you read the subject line of this email correctly." Clearly, Bill Belichick was not part of the survey. On Tap: Today is both National Beer Day and National No Housework Day. It's like this day was made for me. Trading Places: The Trump Administration plans to nominate Derek Kan, Lyft's general manager for Southern California, as an undersecretary in the Transportation Dept....Former Pandora CEO Brian McAndrews has joined the board of Placed, a location-based data startup. ICYMI: Lyft raised another $500 million, valuing the company at $7.5 billion....Inc. has a profile of iFixit, a company that has posted millions of product manuals online in an effort to turn everyone into a DIY repair person....Samsung issued its preliminary earnings report, forecasting better than expected earnings....A few more links: a look at the shady world of PlayStation account resellers...and how AI can help prevent bad beer. In honor of National Beer Day, here's a site where you can play the 80s videogame Tapper. For my millennial friends, Tapper was an arcade game where you served up beers to impatient customers.